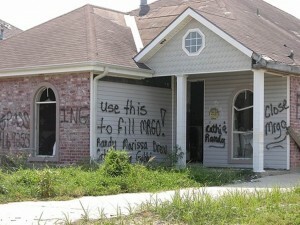 10 years post Katrina - Where have you gone, Mr. Go? 10 years post Katrina – Where have you gone, Mr. Go? Over the coming months as we approach the 10th anniversaries of Hurricanes Katrina and Rita, the Restore the Mississippi River Delta Coalition will publish a series of blog posts that examine issues and topics relevant to these events, particularly as they relate to coastal restoration. 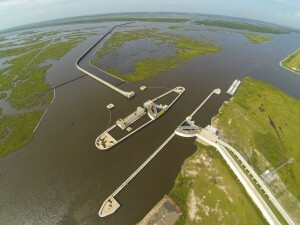 Below, is an update on the Mississippi River Gulf Outlet (MRGO). Home in lower 9th ward – Post Katrina. Even before the storm, locals dubbed the Mississippi River Gulf Outlet (MRGO) a “hurricane surge super-highway”. 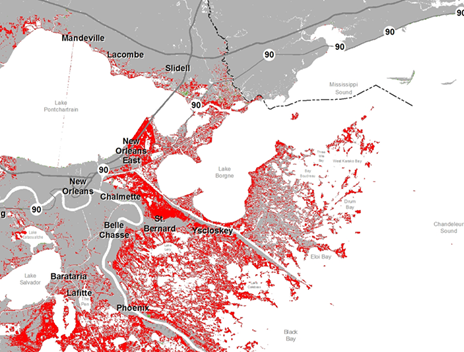 Since its construction in the 1950s, MRGO has impacted over 600,000 acres of coastal ecosystems surrounding the Greater New Orleans area and destroyed over 27,000 acres of wetlands that once served as important buffer from storm surge. Indeed, ten years ago, MRGO lived up to its name and intensified the impact of Hurricane Katrina, creating a funnel that channeled its surge into the heart of communities. The result? Catastrophic destruction. After Katrina, it was clearer than ever that “Mr. Go” had to go. Ten years later, we examine what has been accomplished, what work remains and how you can help. 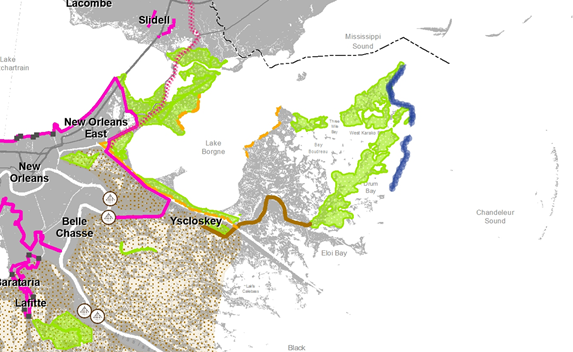 MRGO was finally closed: Following the storm, in 2006, renowned Louisiana coastal scientists released a report detailing the impacts of the channel and recommending its closure. In this same year the MRGO Must Go Coalition – a group of 17 local and national NGOs and community organizations – was formed to advocate for the closure of MRGO and restoration of the ecosystem. Congress passed the Water Resources and Development Act in 2007, mandating the channel be closed to navigation and the Army Corps develop a plan for ecosystem restoration. By 2009, the channel was closed with a rock dam near Bayou La Loutre and a $1.1 billion surge barrier across the MRGO funnel was officially completed in 2013. These closures have moderated surface water salinity, setting the stage for large-scale ecosystem restoration. Advocacy resulting in impact: The MRGO Must Go Coalition worked closely with the Corps to watchdog the drafting of their congressionally-mandated ecosystem restoration plan. The groups helped define the size of the impact area, brought community concerns to the forefront and helped prioritize projects. The coalition, whose positions are captured in these 2010 and 2011 papers, successfully extended public comment period timelines and increased the number of scheduled public hearings. A record 75,000 public comments were sent to the Army Corps in support of MRGO Must Go recommendations. Some of the coalition’s recommendations were included in the Army Corps plan and others, notably, the Violet Diversion, were not. Restoration planning in earnest: In 2012, the final $3 billion Army Corps MRGO ecosystem restoration plan was approved and sent to the Assistant Secretary of the Army and a Programmatic Environmental Impact Statement was completed. Assistant Secretary Darcy then recommended $1.325 billion of projects to Congress for appropriations. This was an unusual move and speaks to strong public activism on the issue, since the Corps has no local sponsor for the MRGO project due to a dispute with the State of Louisiana about who is responsible for paying for these restoration projects. Despite strong public support and heavy activism, no wetland restoration projects in the plan have been funded by the Army Corps to date. Around the same time in 2012, the State of Louisiana released their 2012 Coastal Master Plan, which recognized the impacts of MRGO and touted the benefits of proposed projects. The plan also reflected the important role played by the NGO community and included the vast majority of the MRGO Must Go Coalition’s ecosystem restoration recommendations, including many of those in the Army Corps’ plan. 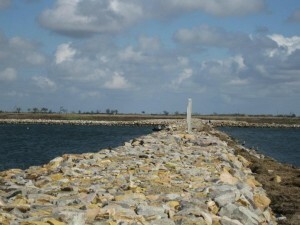 Meaningful restoration: The MRGO projects in the 2012 Coastal Master Plan are proving critical guides for current restoration efforts in the New Orleans area. The Master Plan served as a blueprint for the CWPPRA program as two projects in the MRGO impacted area advanced to planning and design in 2014. It will also guide restoration work funded by the RESTORE Act, legislation that brings Clean Water Act penalties generated from the Deepwater Horizon oil disaster, which directly impacted the MRGO ecosystem area in 2010, to the Gulf coast for restoration. In 2014, the state put forward three key MRGO projects — Golden Triangle Marsh Creation, Biloxi Marsh Oyster Reef Restoration, and the Maurepas Diversion — as candidates for RESTORE Council The MRGO Must Go Coalition has met with RESTORE Council staff on several occasions to ensure they are fully aware of the need for restoration in the MRGO area. We will soon learn if these state-proposed projects were indeed chosen for funding. We’ve had many successes over the years with the closure of the channel and developing plans for restoration. However implementing these plans and restoring our critical coastal ecosystem remains. As the RESTORE Act process plays out, more funding will become available for restoration under direction of the RESTORE Council, State of Louisiana, and local parish governments. Those decision-makers will have the opportunity to ensure funds are used for restoration based on the best science and to make sure MRGO is addressed. It’s up to everyone who cares about the future resilience of our region to speak up. The loss of wetlands caused by the channel leaves us without our historic, protective wetland buffer – a major line of defense against storm surges and an important factor in the effectiveness of our new $14 billion levee system. We can strategically restore our region’s protective wetlands and sustain a healthy coastal ecosystem, but it’s up to us to be our own champions for resilience and ensure the right projects are funded. As we approach the tenth anniversary of Hurricane Katrina, we have our work cut out for us to ensure that restoration, which is vitally important to our region’s future, moves forward with urgency. Visit restorethebayou.org to learn how you can view the MRGO ecosystem impacts in person, learn more about ongoing ecosystem restoration and how you can get involved. Check out these albums from the MRGO Must Go Facebook page to see photos before and after the outlet’s closure.